From our first meeting, he has asked some of the greatest questions, from the difference between Catholics and Protestants, what is predestination, where does sin come from, is it possible to read the Bible on my own and understand it, and more! He says he is an atheist, yet he is on a journey of coming to faith, longing to believe in Jesus! He has returned almost every Friday night, even when he has been very tired, and visited with us, sometimes leading to dinner afterwards! One evening after meeting several times, He told Katie and I that meeting with us has put a desire in him to have relationships with people again when he had decided years earlier that he no longer wanted to! So good! A week ago, he attended our weekly open meeting where we have worship and a message (which I gave)! During the worship, I saw him looking around, seeming confused, so I sat down and asked if he was okay. He said, "So many voices... They sound holy!" I personally do not think he was just hearing the voices of the people in the room but angels singing along with us in worship to Jesus! (But I didn't get a chance to tell him... ;) Later on after the message, we talked about what I had shared, and he confessed that it was something he dealt with, one of the reasons he wanted to come to faith in Jesus believing that God would help him in this area of his life! Before the night was over, he said, "I will have faith one day in the not-so-distant future"! 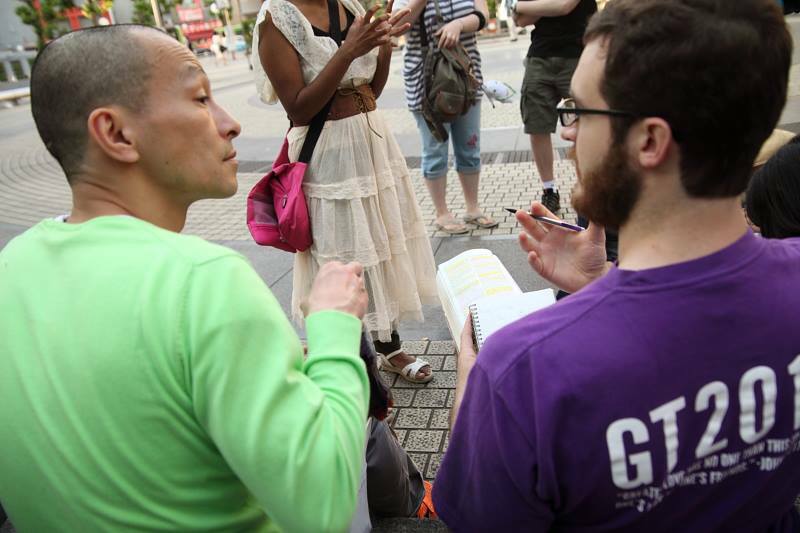 Please be praying for Seiji as we continue to meet and disciple this not-yet-believing Japanese man! I believe he will be very influential in reforming the Japanese government and education system to lead to a more free and powerful Japanese spirit from individuals, giving them hope and a future! Pray that he would encounter Jesus and would come to trust Him even without understanding everything!